Giuseppe Verdi (b orn Roncole near Busseto, 9 or 10 October 1813; died Milan 27 January 1901) was an Italian composer of operas. Verdi and Richard Wagner were the greatest composers of opera in the 19th century although they were completely different from one another. When Verdi was a young man the most famous opera composers in Italy were Gaetano Donizetti and Vincenzo Bellini who wrote in the bel canto tradition. This meant that their operas had beautiful tunes which were written for singers to show off their voices, even if what they sang did not suit the story. During his long life Verdi changed opera so that it did not have to obey old-fashioned rules. He made the drama the most important thing and the music is there to help the drama; that said, Verdi is most remembered for the power of his music. The small village where Verdi was born lies in the valley of the Po River in the north of Italy. It was a poor district. His father was an innkeeper who had a small farm. The young boy must have been very talented. He was given a spinet which he kept all his life. At the age of 9 he often played the organ for church services in the village when the organist was away. A few years later he composed music for the amateur orchestra in Busseto. A man called Antonio Barezzi knew many important people and he helped Verdi a lot. Later Verdi married a daughter of a friend. Barezzi sent him to Milan so that he could study, but Verdi had not been taught the piano properly and he did not get a place in the music conservatory. He had some private lessons and learned a lot about opera as well as about literature and politics. In 1839 he composed an opera: Oberto, conte di San Bonifacio, which was performed in La Scala, the world-famous opera house in Milan. It is not one of his greatest operas, but it helped him to become well-known and he was asked to write three more operas for La Scala. When his next opera was produced it was not a success: the audience did not like it and they hissed and booed. There was also tragedy in his personal life at this time: his two children and his wife all died. Verdi managed to overcome his unhappiness in 1842 when he produced his opera Nabucco. This was a great success and made him world-famous. He started to work very hard, composing two operas a year. He not only had to write the music but organize all the people to perform it. It was a huge workload. His opera Ernani (1844) was one of the best from this period. In 1847 he had another big success with Macbeth. This opera, based on Shakespeare’s famous play, is still one of the best-loved of all operas. He was becoming a success. For centuries Italy had been a collection of several countries, each with their own ruler. In the 1850s there was a lot of political unrest in the country. Verdi often wrote music for large choruses in his operas. The words of these choruses were often about fighting for freedom, and it was often thought that the songs were encouraging people to revolt. The song Va pensiero from his opera Nabucco was about the Hebrew slaves who were captive in Babylon. People chanted it in the streets with the words suitably changed. Verdi became a great national hero. Italy eventually became one country in 1861. Giuseppina Strepponi was the soprano who sang the part of Abigaille in Nabucco. Verdi fell in love with her. She had lived with another man and had three children so she felt that she was not good enough for Verdi. They eventually married in 1859. She was a great support to him until her death in 1897 although Verdi was not an easy husband to live with. He moved back to Busseto with her. He continued to travel a lot but did not let his wife come with him, leaving her behind in Busseto where she was not happy because many people there did not like her. Three more famous operas were written at this time: Rigoletto in 1851 and Il trovatore (The Troubadour) and La traviata, both in 1853. These operas have many tunes which became famous. They are full of exciting drama in which the characters are very skilfully described by the music. The music is not divided so clearly into recitative and aria like it had been for two centuries. Instead, the music is developing all the time, the arias run straight into the following music. He had a brilliant sense of drama, but he often had to fight hard to stop producers making changes to what he had written. 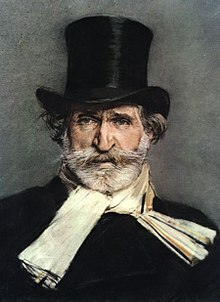 Verdi often had trouble with the censors (the officials who decide whether the opera should be allowed to be performed). His opera Rigoletto was based on a story called Le roi s’amuse by Victor Hugo. The attempted murder of a king was not thought to be a suitable subject. Verdi had to change the king into a duke in his story and make some other changes before the opera could be performed. The story of his opera Traviata, based on a novel by Alexandre Dumas fils, was also thought to be immoral. At the first performance the audience laughed because the heroine, who is supposed to be dying of consumption, was very fat. However, the opera soon became enormously popular. Verdi had become very famous by now, and was asked to compose for the Opéra in Paris. He had to write operas in the French style: operas with five acts and a ballet based on a serious story. None of the operas he wrote at this time for Paris belong to his best works. He was more inspired when writing for the Italian theatres. Simon Boccanegra has a complicated plot, but the characters are described beautifully by the music. Un ballo in maschera (The masked ball) was about the murder of King Gustav III of Sweden. Again the censors did not like it and he had to change the story to a setting in Boston which rather spoiled the story. In the 1860s his best works were La forza del destino (The Force of Destiny), written for St Petersburg, Don Carlos written for the Paris Opéra, and Aida for the new opera house in Cairo in Egypt. Aida is considered one of his most perfect works. The first performance was not without difficulties: Verdi was having a long argument with the conductor Mariani who refused to go to Cairo to conduct it. The argument was made worse by the newspapers who accused Verdi of taking Mariani’s girlfriend. This caused a great scandal. Verdi retired in the 1870s. He was a rich man who owned a lot of land. He gave a lot of money to charities, particularly to one charity for elderly musicians. Even in retirement he was persuaded by his publishers to write two more operas. He became fascinated by Shakespeare and he wrote Otello to a libretto by Arrigo Boito. This was a brilliant libretto and it helped him to write a great masterpiece in which every little detail of the story is beautifully described by the music. His very last opera, Falstaff (1893) is based on Shakespeare’s Merry Wives of Windsor. Verdi continued to write a few religious pieces in his old age. He died of a stroke in Milan in 1901. This page was last changed on 4 July 2018, at 04:30.